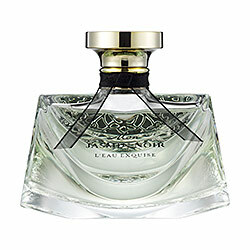 Scent Description and Notes: “An exquisite melody for a bright Eau de Jasmin. Born of the delicate jasmine flower, together with the exuberant water of fountains and the sublime beauty of a woman. Inspired by the enchantment of the splendid Italian-style gardens of the renaissance, specifically by a fragrant walk through the shade of the Boboli Gardens—where a floral breeze exhales the freshness and sparkle of the fountains. Pink Pomelo, Fresh Green Almond, Jasmine White Tea, Jasmine, White Musks, Woods. Bottle Design and Artwork: This is a standard 1.5ml sample vial. The vial is a clear glass, a plastic nozzle, and black writing (font varies in size, and the “mon” is in Italic cursive script) featuring the brand and scent name along with the amount, and production information. ITV: It’s really more refreshing than I had anticipated. The jasmine white tea and the white musk are refined and classic but also bright and uplifting. I also pick up the pomelo very clearly, but it’s a little bitter on the paper I’m testing. Wet: Scratch bitter. On my skin, the pomelo compliments the musk and jasmine tea beautifully. It’s a gorgeous citrus scent that’s so light it is almost floral. So far, this is absolutely beautiful – very much an evening scent, but could work very well in an office setting on an afternoon date. Dry: It scent remains fairly consistent, becoming slightly powdery, but still floral with tea and musk notes just under a light pomelo. Very nice.